Flagship product of Alexandre Turpault’s new Spring/Summer collection, the bed linen « Nouvelle Vague » is a worthy spokesperson of the mark on its commitment towards a rational consumption. 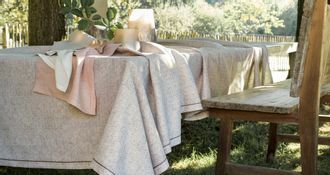 With this bedding set, Alexandre Turpault chose a linen woven and ennobled in France, rinsed with pure water and without any chemicals. An ethical choice for a unique comfort. The expertise of the brand offers a sustainable and modern bedding, while remaining ecological and socially responsible.